The latest market research report by Technavio on the global marine auxiliary engine market provides an analysis of the most important trends expected to impact the market outlook from 2018-2022. 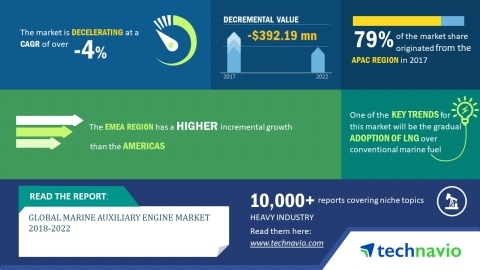 According to Technavio analysts, the global marine auxiliary engine market is expected to reach USD 1.98 billion by 2022. The growth of commercial shipping is a major factor driving the market’s growth. Globalization has directly affected the growth of the global commercial shipping. As economies across the world are interlinked, the health of the global economy affects the global trade volume. International trade is expected to increase with the expansion of the economy, wherein seaborne trade plays a crucial role. Thus, economic development and growth provide enormous opportunities for the marine industry, mostly due to the global demand and supply of commodities and manufactured goods. In the shipping industry, nearly 70% of fuel demand is attributed to the container shipping, bulk carrier, general cargo, and tanker. This includes crude and chemical products, sector. The shipping industry uses a wide range of fuels like hydrofluotoolefin (HFO), marine diesel oil (MDO), marine gas oil (MGO), and bio-alternatives such as biodiesel and straight vegetable oils. Other fuels used include LNG and biogas, along with methanol and hydrogen, both of which are derived from methane or wood biomass. “The marine engine technology includes two or four stroke diesel engines, diesel-electric motors, gas engines, and fuel cell technology. The technology used is extremely dependent on the fuel used. It is projected that the marine fuel mix will see a decline in the proportion of conventional fuels used. The rising usage of LNG in the marine fuel mix provides a potential market for marine engine manufacturers. The exploitation of such potential will lead to the growth of the market,” says a senior analyst at Technavio for research on tools and components. This market research report segments the global marine auxiliary engine market into the following key regions, including the Americas, APAC, and EMEA. APAC was the leading region for the global marine auxiliary engine market in 2017, accounting for a market share of nearly 79%. By 2022, APAC is expected to witness the highest growth in terms of market share.